One thing I love to do when I’m abroad is discover new cafes and coffee shops. 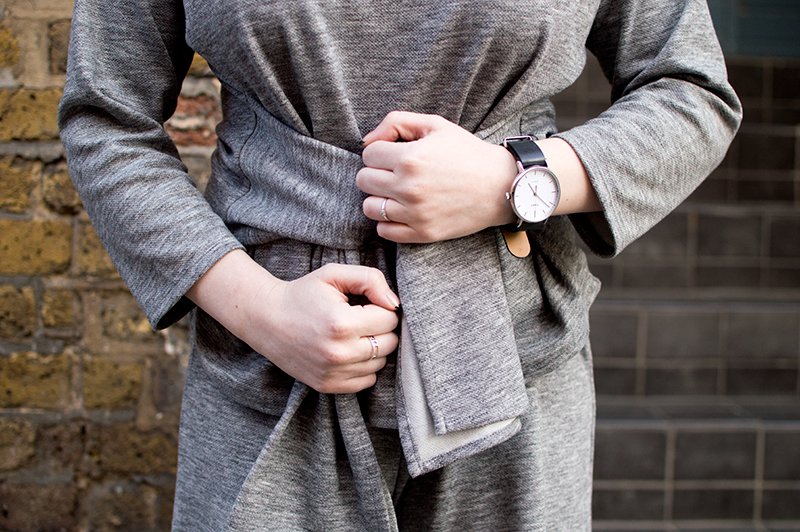 It’s one of my favourite little luxuries at home, so to do it whilst travelling is a welcomed pleasure. So when I headed back to Tokyo this year I knew I had to find the best places in town. Luckily for me, my good friend Alanna and her husband are coffee fans too. 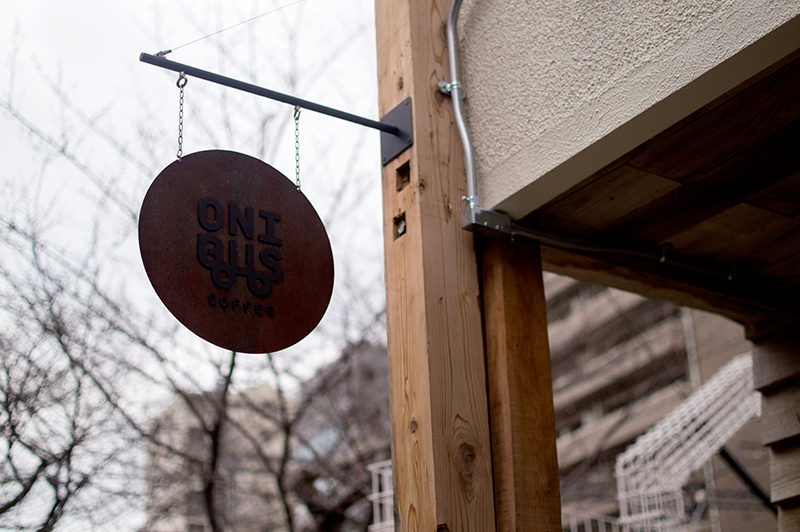 Being the wonderful people they are, they curated us our own Tokyo coffee tour. Below you’ll find my suggestions from the coffee tour we did together, and a couple I’ve thrown in myself. 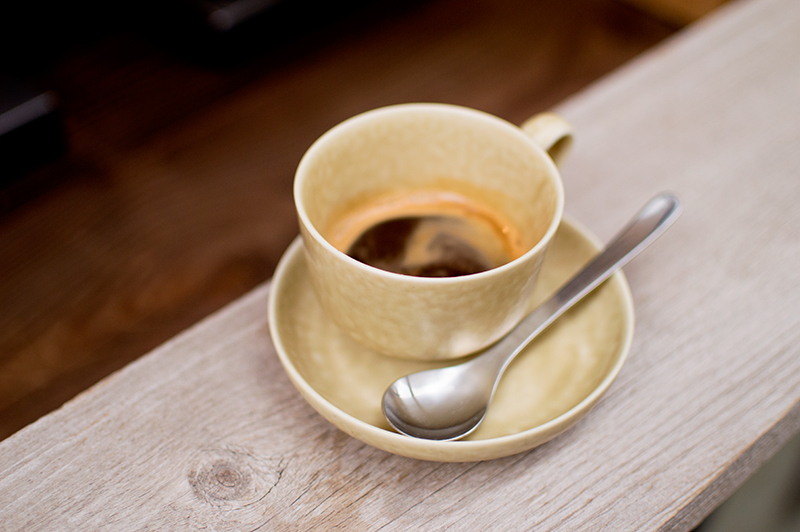 Visit here if… you like your coffee with minimal fuss, and a chilled vibe. 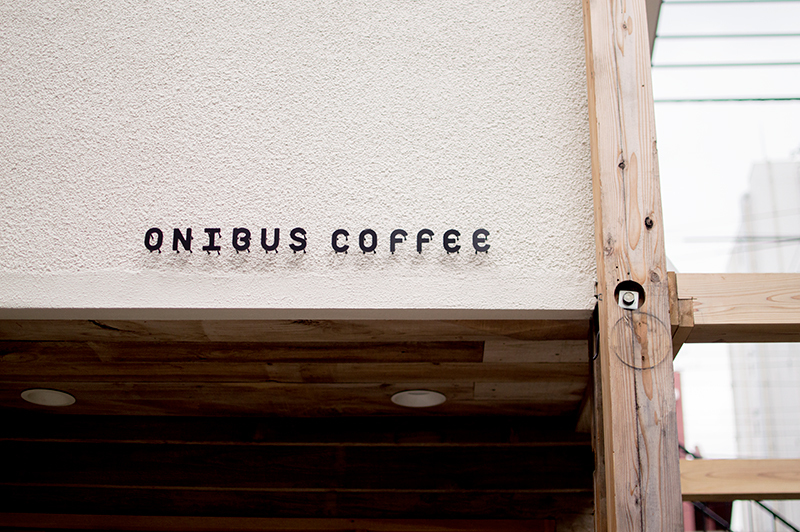 With 4 locations in Tokyo, Onibus is no new name to the Japanese coffee scene. 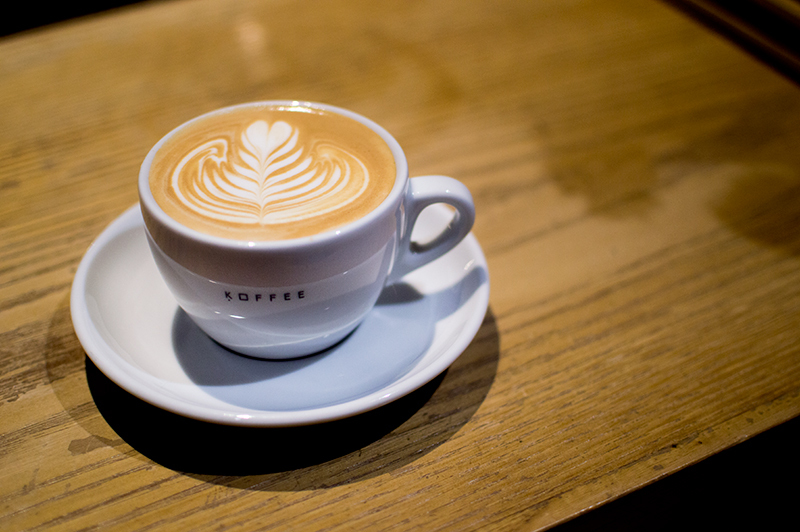 In fact they’re doing so well that they’re making waves in Europe too; they just got back from Berlin, and a collaboration with Bonanza Coffee. 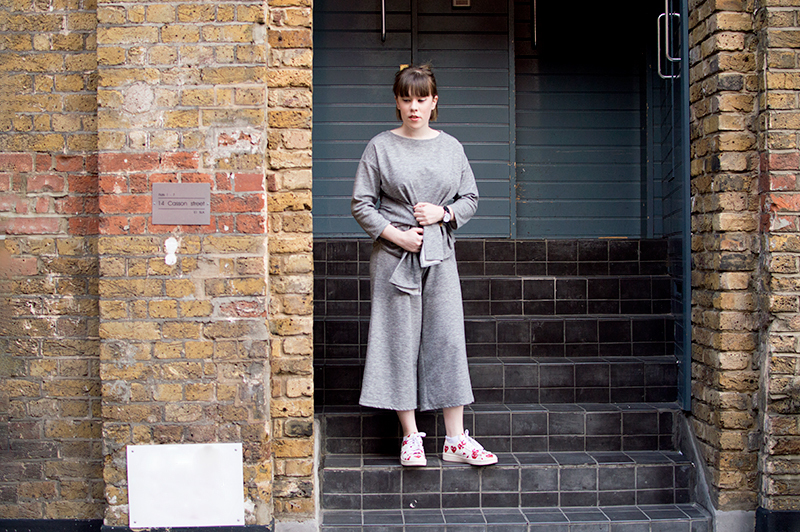 Visit here if… you love chemistry, and minimalist surroundings. 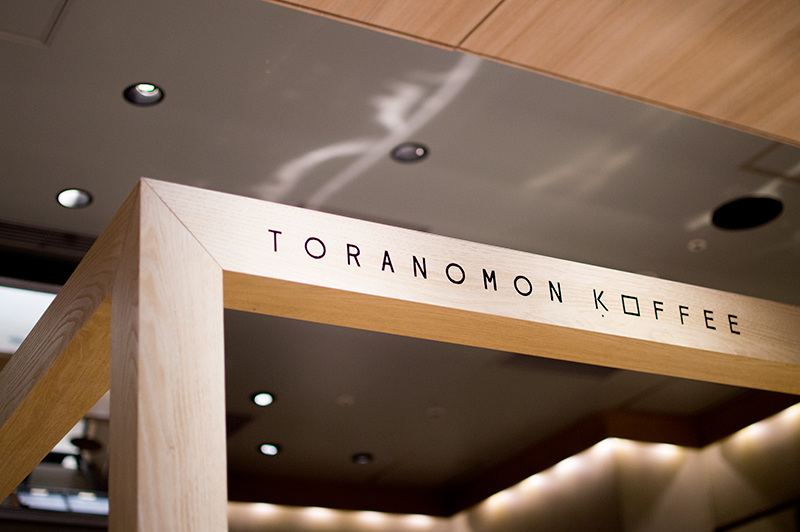 Toranomon coffee is all about the chemistry behind coffee. They love experimenting (the lab coats are worn for a reason) and are well known for it. 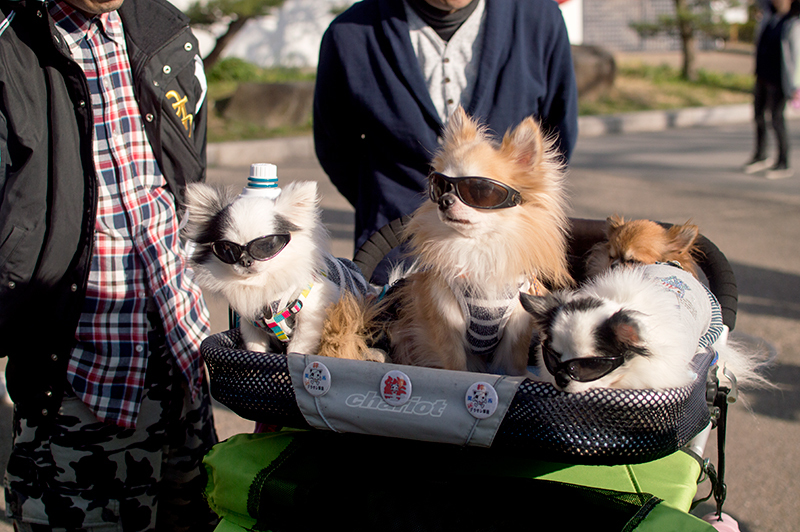 You can find them across Japan, and even in Hong Kong. Visit here if… if you care about fresh, simple ingredients. 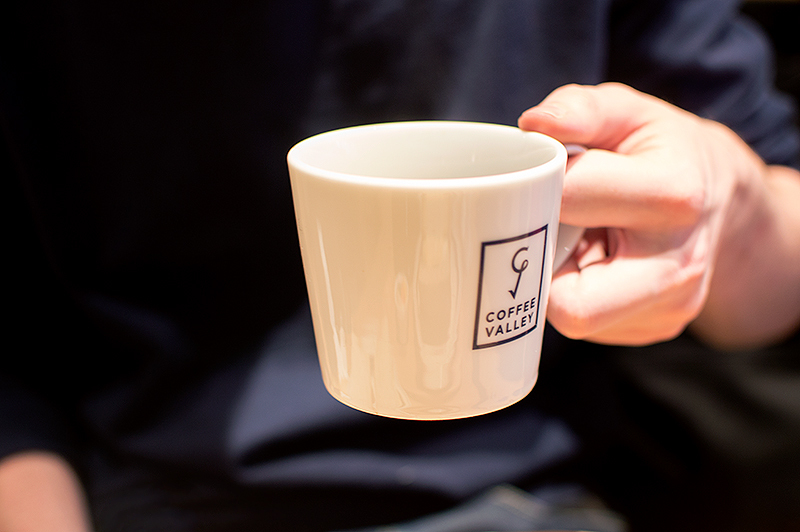 Coffee Valley isn’t that well known, but that doesn’t mean it isn’t popular. The cafe boasts queues for it’s fresh coffee, and delicious food. Don’t worry though, it’s worth the wait! Visit here if… you want to hang out somewhere unique and cool. 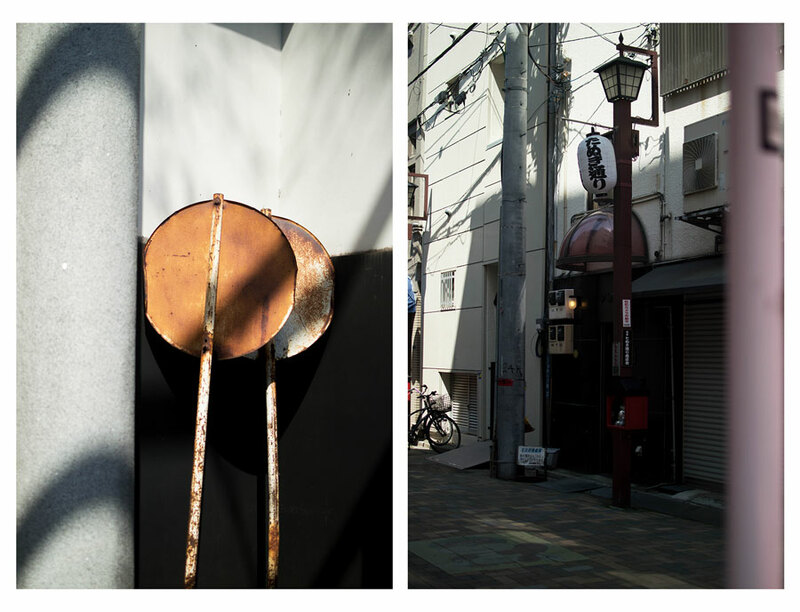 Bird & Ruby is tightly nestled in the middle of Sendagaya, on a cross walk, opposite a traditional shrine. Yep you couldn’t get much more Tokyo than that (the perfect mix of old and new). Offering up coffee and paninis, you’ll look effortlessly cool as you sip on your espresso, and flick through the latest issue of Popeye. 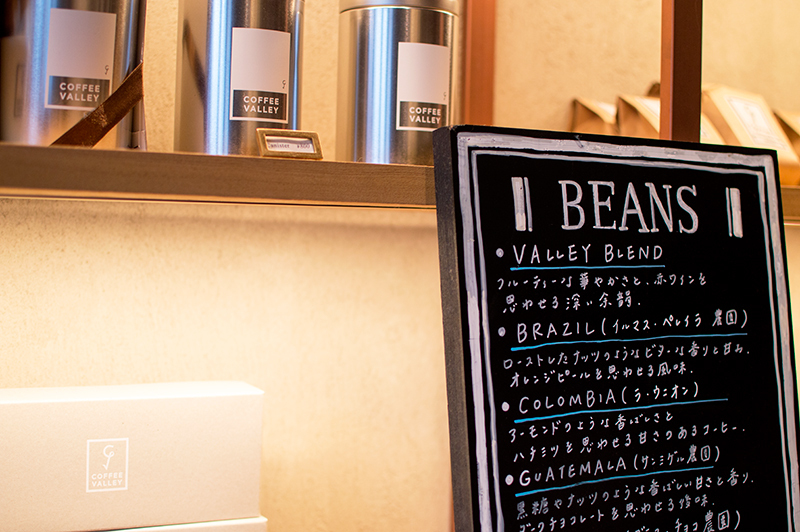 Visit here if… you’re out shopping and need a coffee fix. 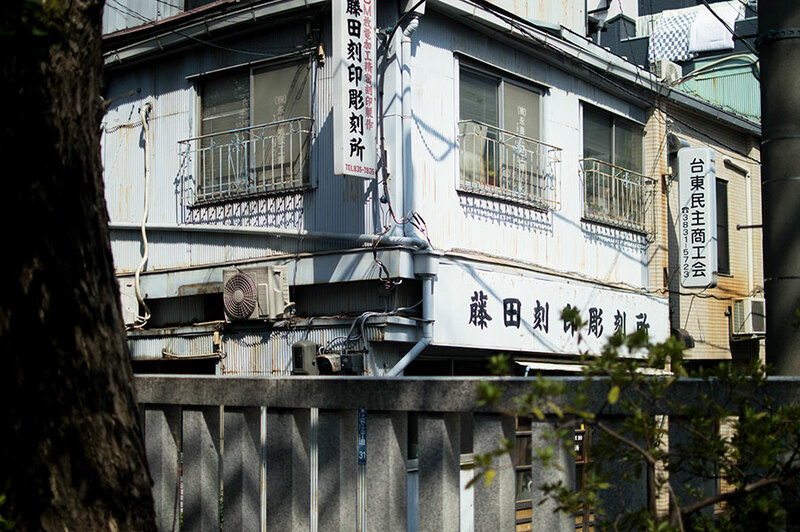 Sarutahiko has a few locations in Tokyo, but the Shibuya branch is a great location if you just want to get away from the hustle and bustle. They have a great selection of coffee, and are super enthusiastic. 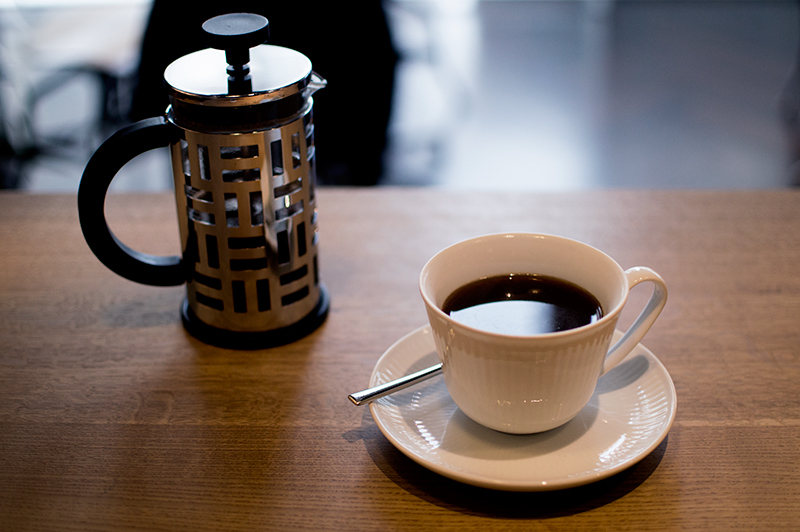 Feel free to share your favourite cafes in Tokyo in the comments! 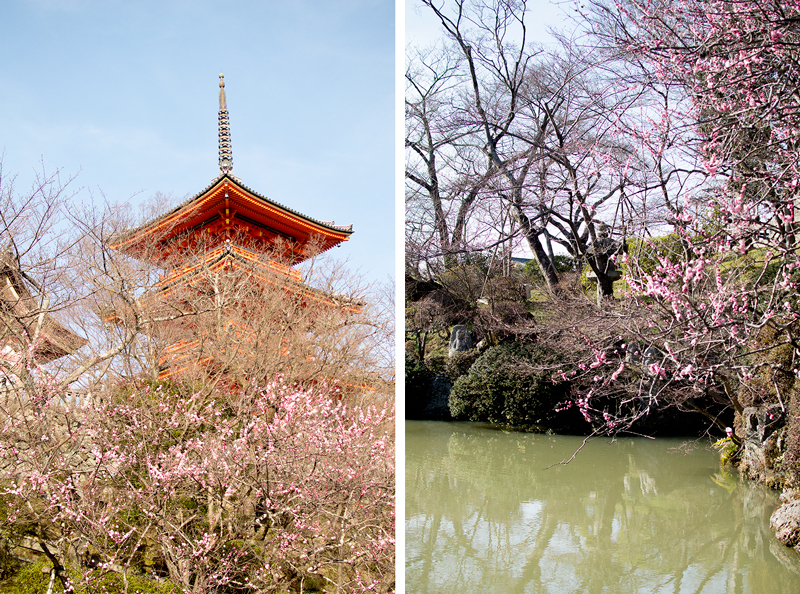 Check out the rest of my Japan Travel Diaries (including Kyoto, Osaka and Tokyo) here. 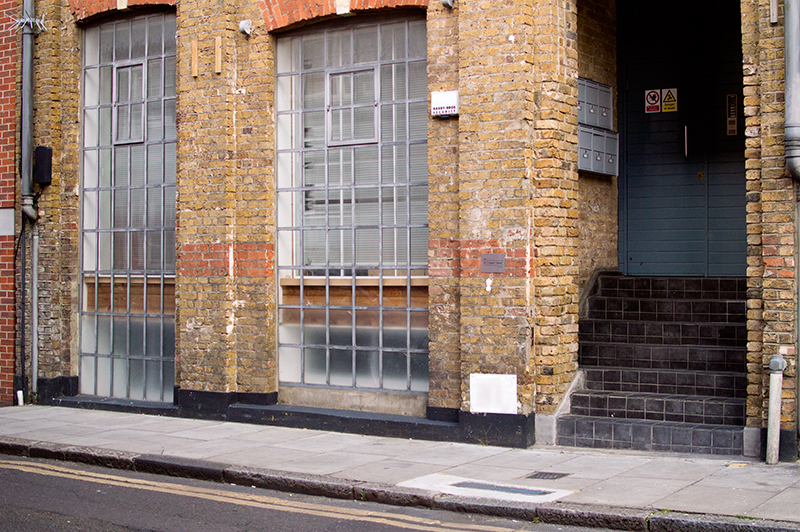 Have you ever walked into a place and just been taken aback by its sheer beauty? That’s exactly what happened to me when I first walked into Aoyama Flower Market’s Omotesando branch, during my recent visit with Nicole. 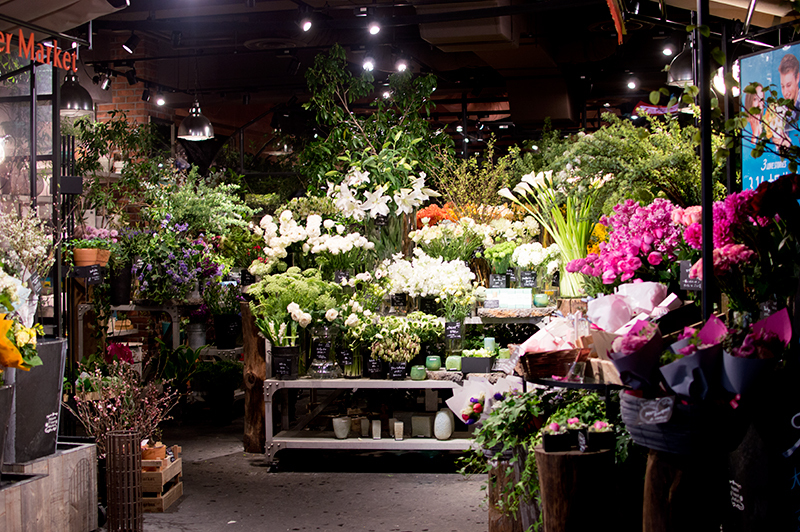 The flower shop is well known, with outlets across Japan. 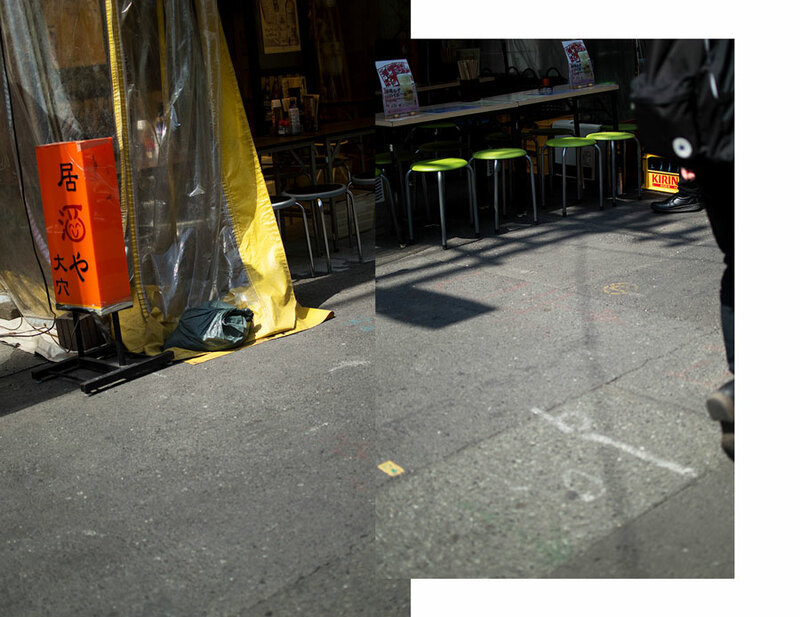 However this particular location is nestled in amongst the high-rises of Aoyama, and only a minute walk away from Omotesando tube station. Perfect for my inner mori gal. 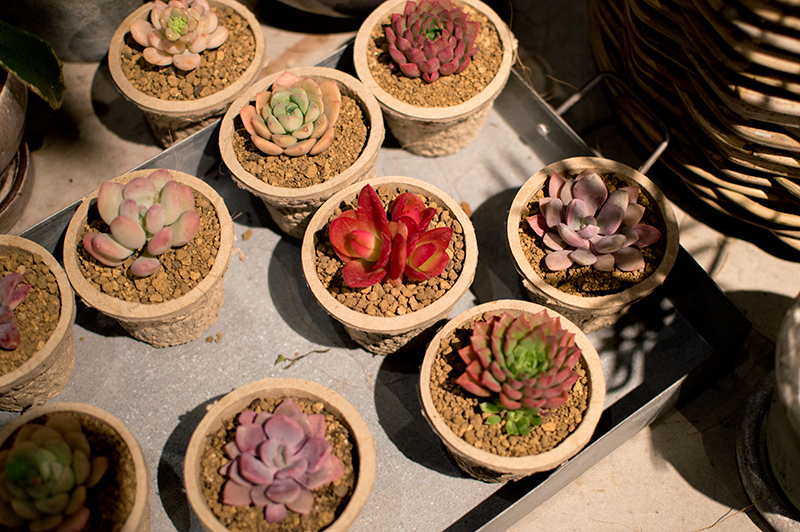 The concept behind Aoyama Flower Market’s tea house is quite simple; a greenhouse. Yes, it may sound boring, yet it’s anything but. 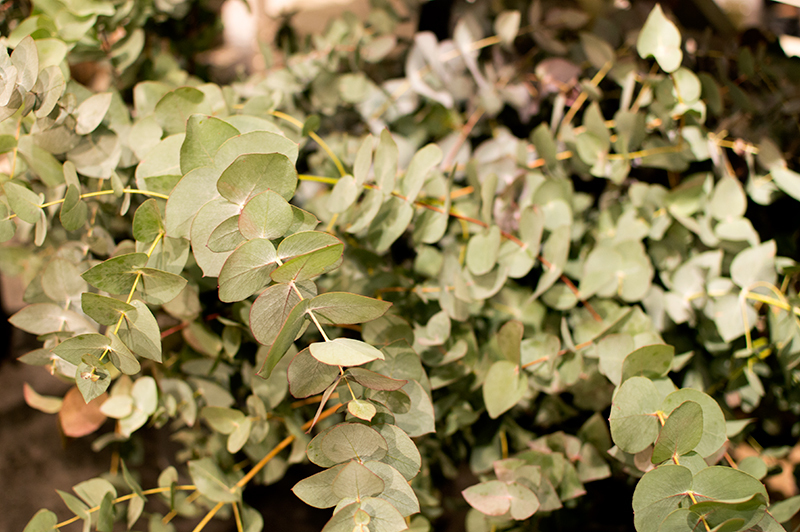 Think blooming flowers, ivy crawling along the walls, and a botanical inspired menu. That’s exactly what you’ll find here. The idea of “living with flowers everyday” was on the mind of AFM’s interior design team when they opened this plant haven. And boy did they deliver! The menu here is pretty simple in terms of ingredients. You’ll also find alternating seasonal specials, which are based on particular flowers or holidays. As you can imagine most dishes are vegetarian and vegan friendly, however there is the odd meat dish on the menu; for those who just can’t go without. You won’t find any coffee on the menu either, only tea. So how did I get on as a coffee-loving, meat-eater? 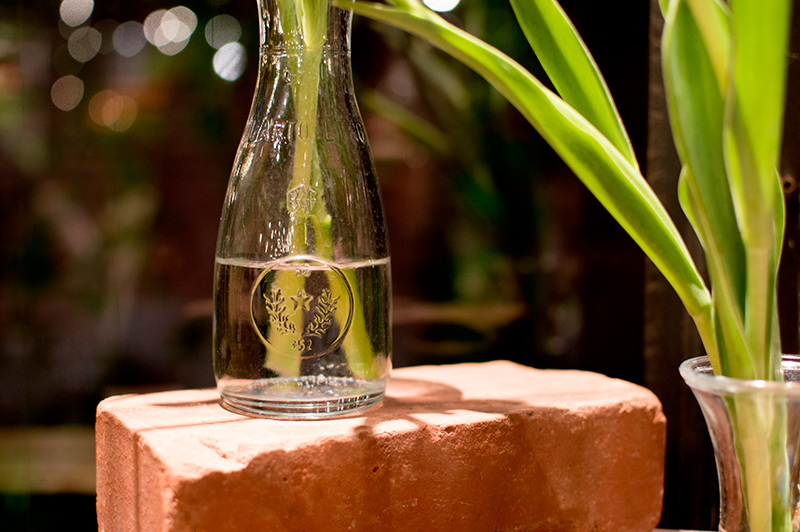 We visited during sakura season, so naturally the menu reflected this. Not surprisingly you can often find cherry blossom flavoured (slightly reminiscent of rose) products and dishes at this time of year. 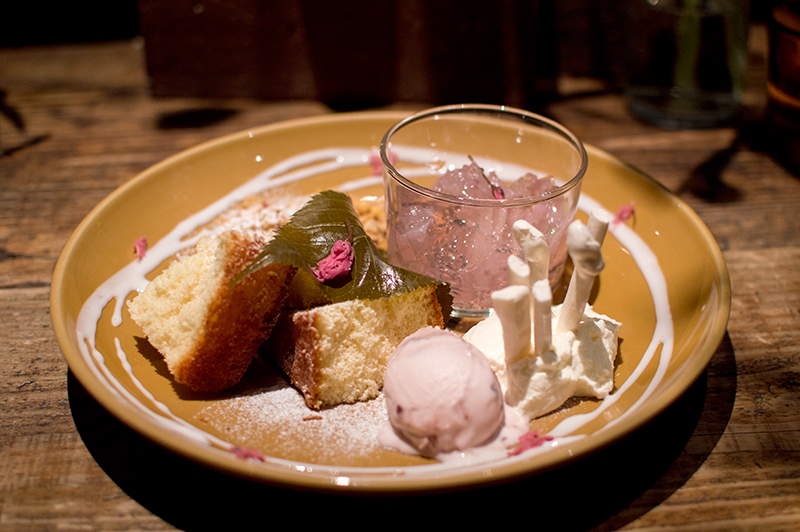 This dish in particular included sakura jelly, chiffon cake, sakura ice cream and cream with meringue “mushrooms”. I personally loved the taste; subtle and sweet, with a nice mix of textures. This dish was perfect for me! Gimme mint any day! Normally I drink a lot of mint tea, but I decided to cool down with something slightly more refreshing – and fizzy – this time. I was brought some optional syrup for my drink, which I didn’t add. 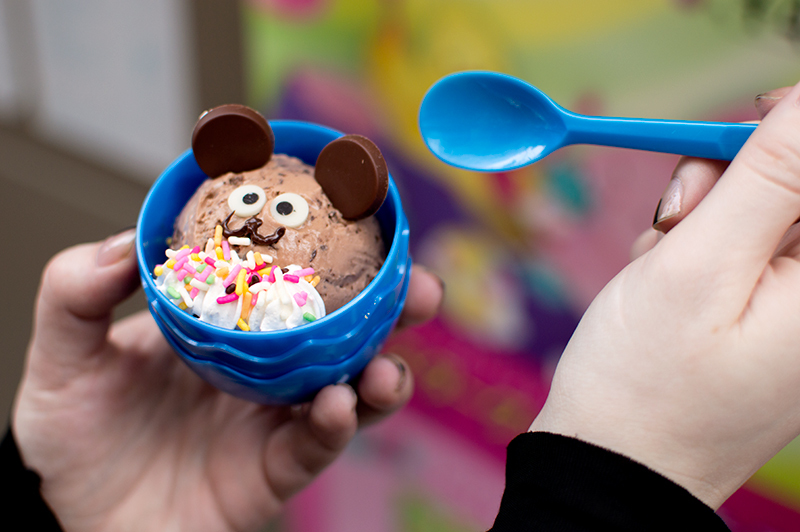 However it’s perfect for those with a sweet tooth. I didn’t get a photo of my soda, but I did snap one of my friend’s mint tea, which was just as pretty! This is a popular place, so be prepared to wait. As a Londoner I don’t mind doing this, in fact it’s second nature when it comes to finding a decent restaurant. To be fair we only waited around 20-30 minutes, but you may need to stand if the few waiting chairs in the cafe are taken. 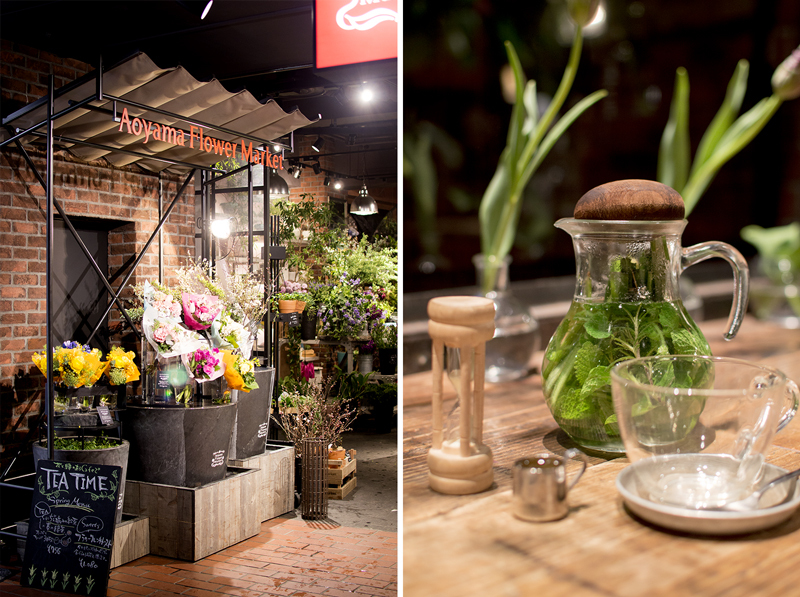 If you fancy some time away from the hustle and bustle of Tokyo, Aoyama Flower Market Tea House is an incredibly relaxing, comforting spot to visit. From browsing the store for plants and flowers, to enjoying some sweet treats in the restaurant, I really enjoyed the food and atmosphere here. I’d definitely recommend it, and it’s certainly somewhere I would go back to on my next visit to Japan. 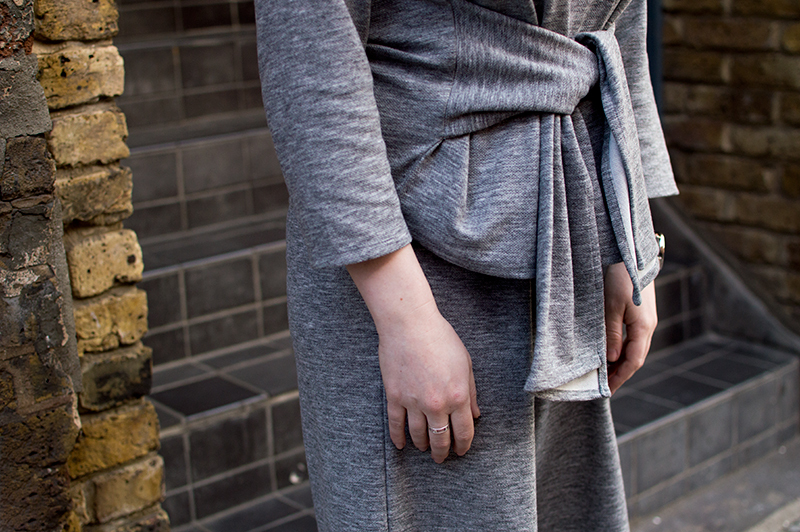 What do you think of when I say Kyoto? 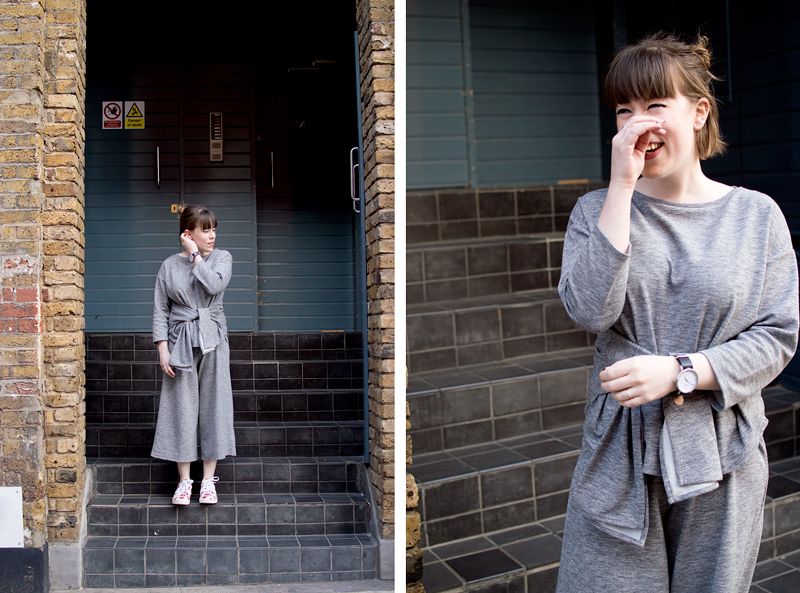 The streets of Gion? Geisha? 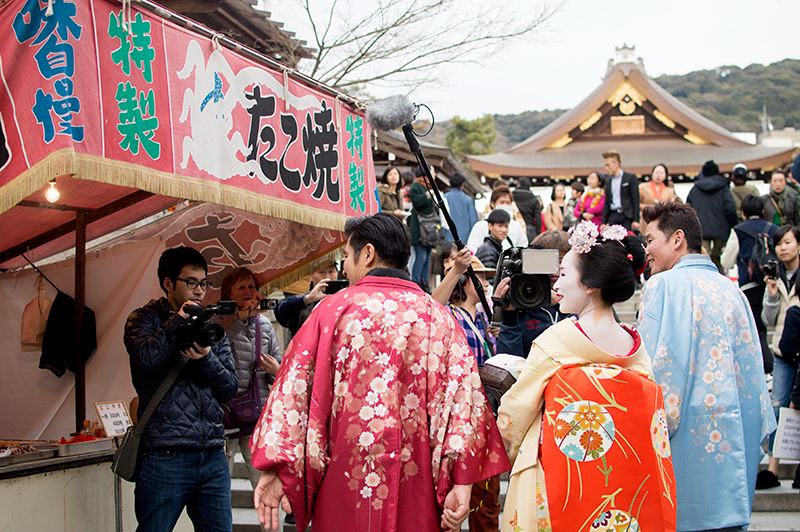 Well more often than not, the “geisha” you’re taking a photo of is actually a tourist who has hired their kimono. 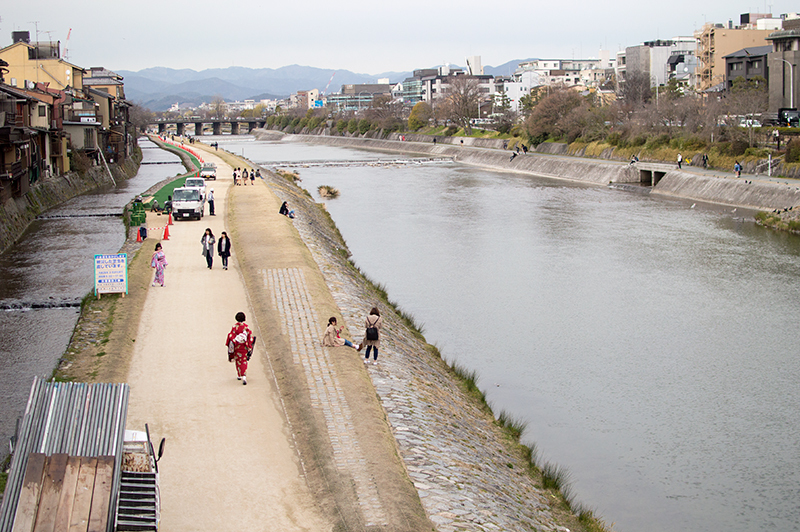 My point here is that people come to Kyoto expecting to see “the real kyoto”, but they so often fall into the lure of travel guides and tourist traps. Sure there’s nothing wrong with doing all these things. 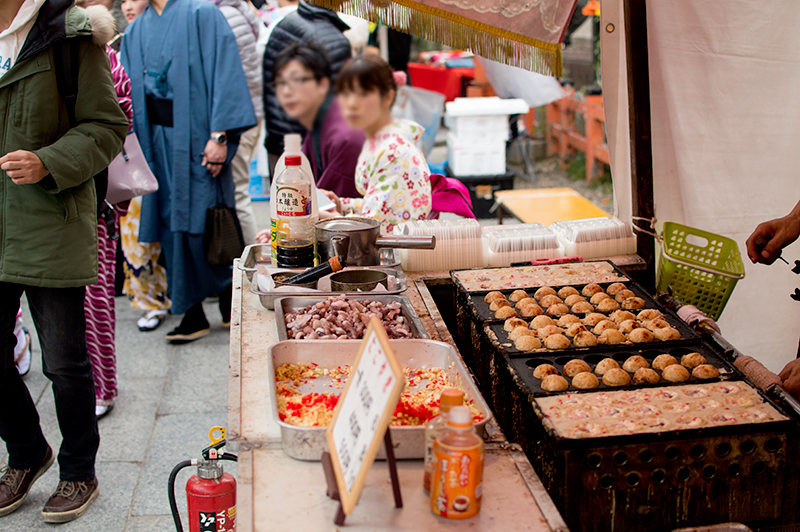 You most certainly can do these things in Kyoto, and you should! It’s just a shame that most people don’t see more of this beautiful city. 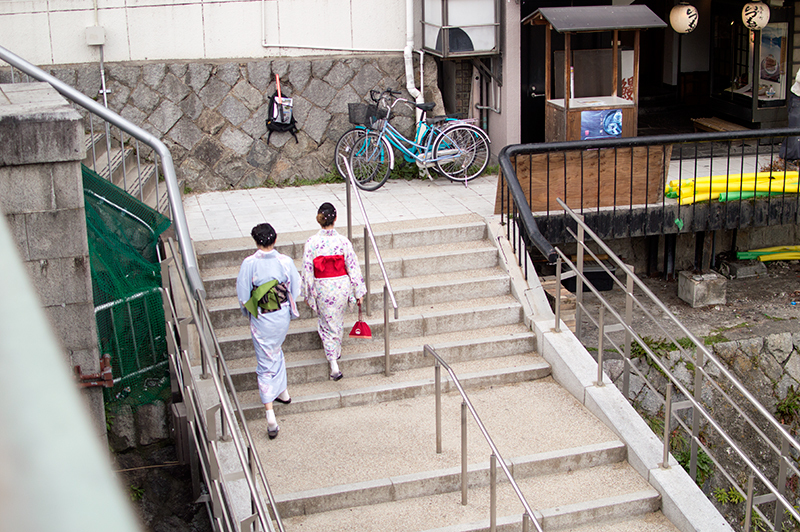 Much like Buckingham Palace and Big Ben are to London, Kyoto is so much more than Gion. 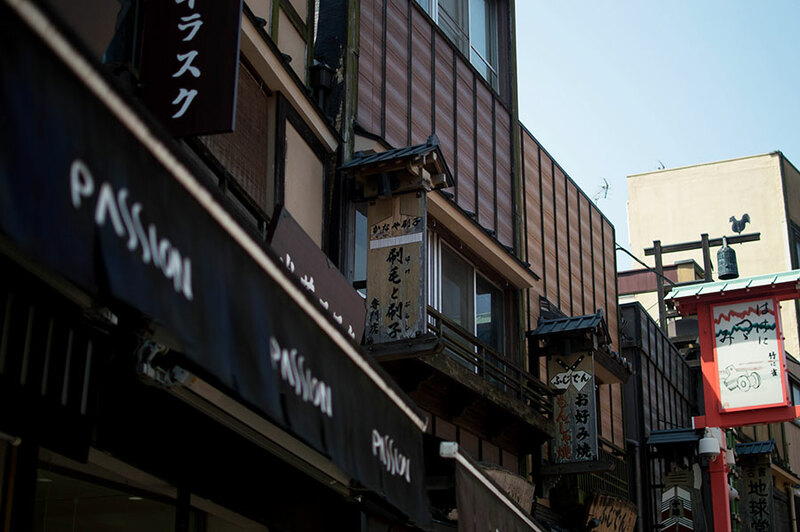 Teramachi/Shinkyogoku Shopping Arcades – These covered shopping streets run alongside each other, and are packed full of interesting shops, restaurants, arcade centres and cafes. 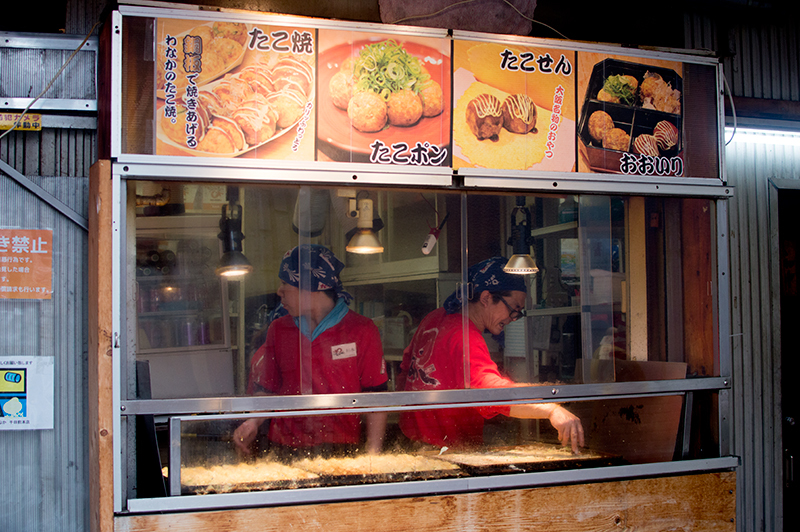 Shinkyogoku also houses a Floresta Doughnuts franchise – you know, the cute animal doughnut place. It’s definitely worth stopping by for a natural doughnut. 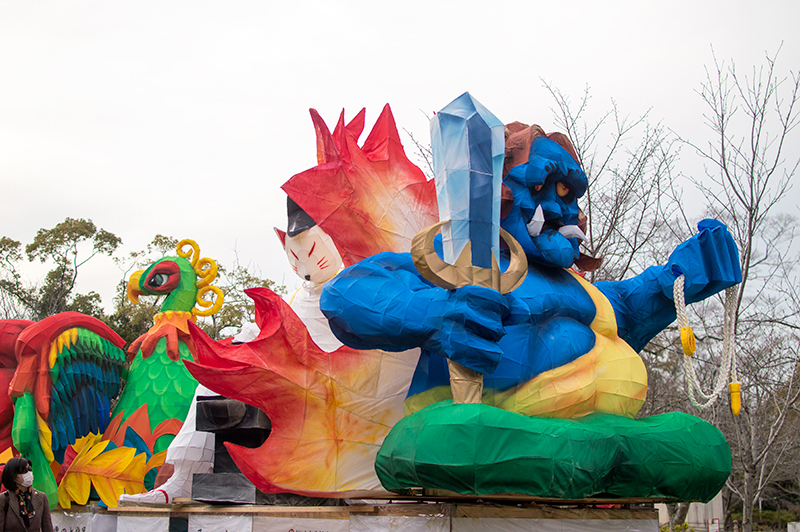 Shrines and Temples in Kyoto – check out my guide for the best shrines and temples in Kyoto! Do a lot of walking! 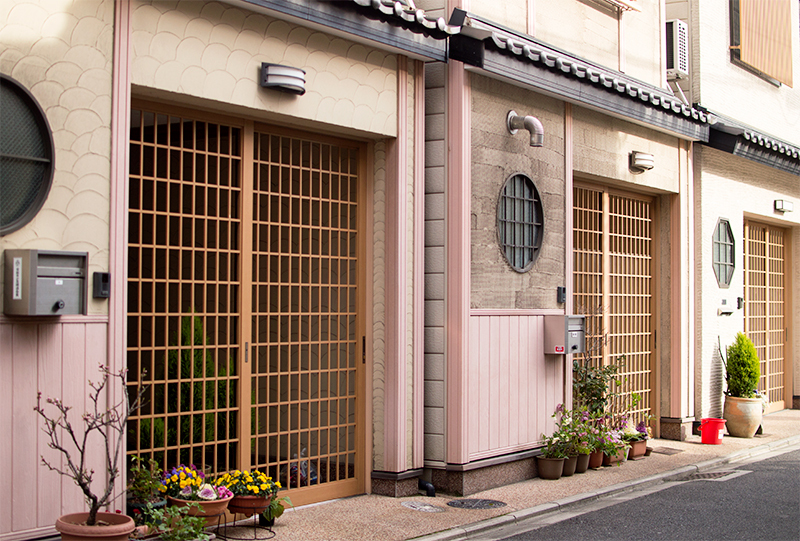 Kyoto has some beautiful alleys and back streets, packed full of culture and history. 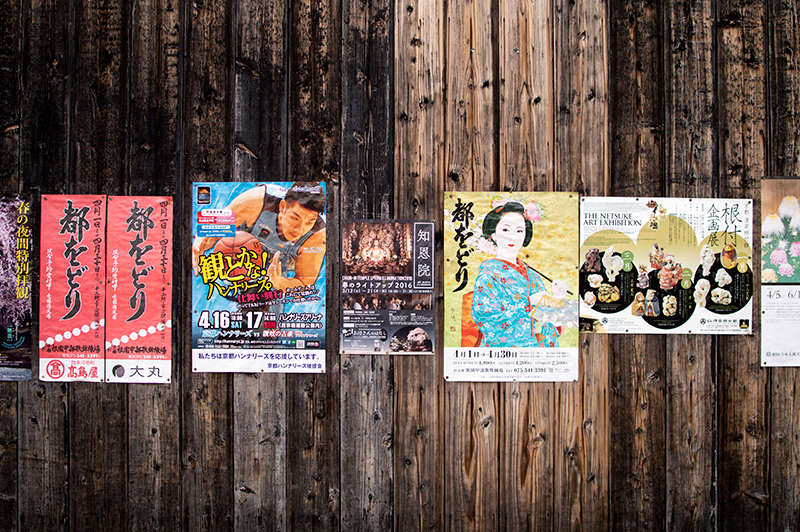 Minamiza Theatre – Fans of the traditional Japanese art form Kabuki, probably already know of Minamiza. 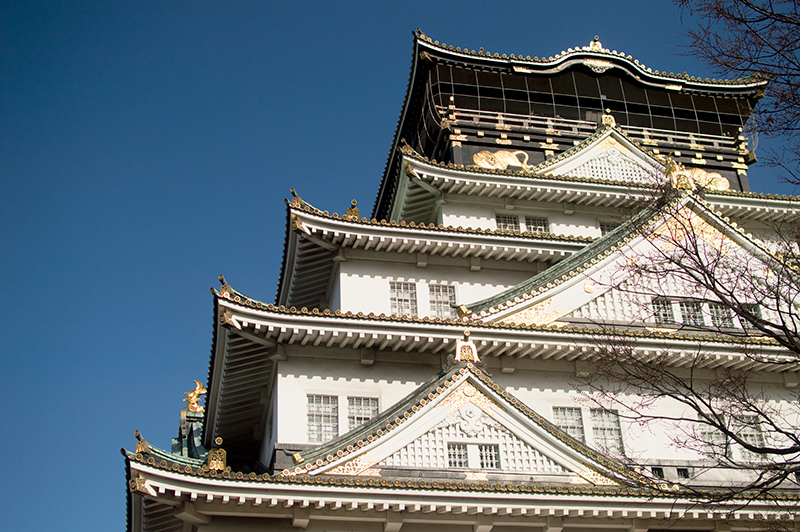 This grand building sits at the top of Shijo-Ojhashi, and is the go-to stop for kabuki in Kyoto. Don’t worry, non-Japanese speakers can enjoy a show just as well as anyone else. Buy some matcha, duh! 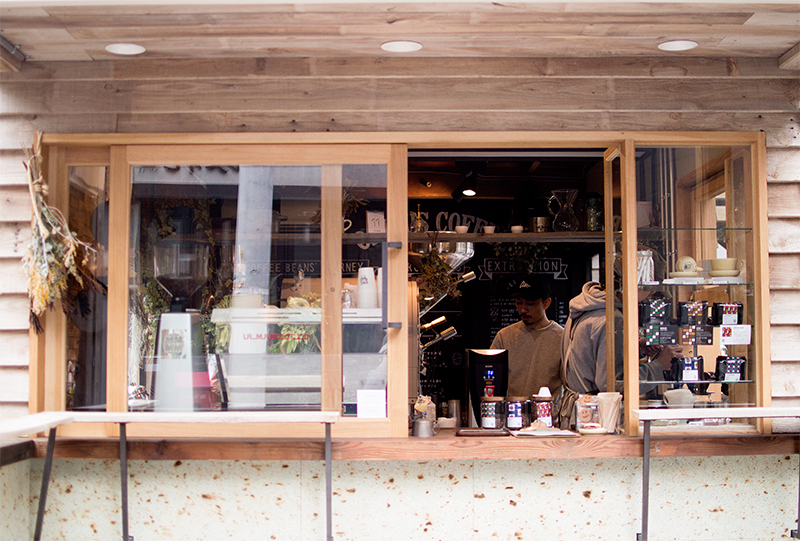 Whether it’s a gift, or for yourself, Kyoto is littered with matcha goodness. 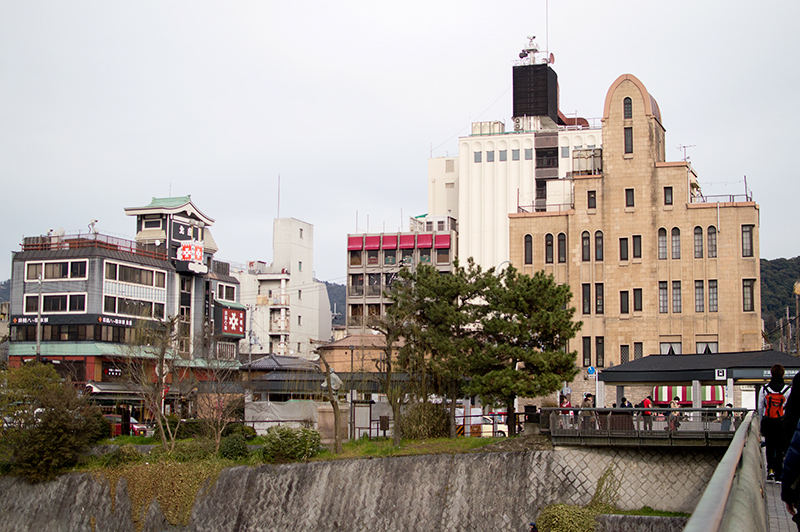 Kyoto Manga Museum – yes it is totally a thing, and it’s a must-visit for any manga fan. 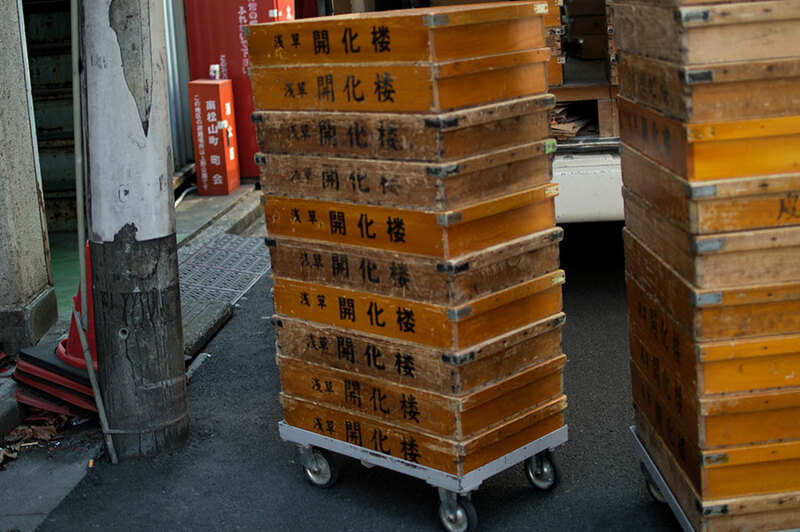 And finally, go for a walk around Gion and take a whole ton of photos. It’s beautiful, and you won’t regret it! 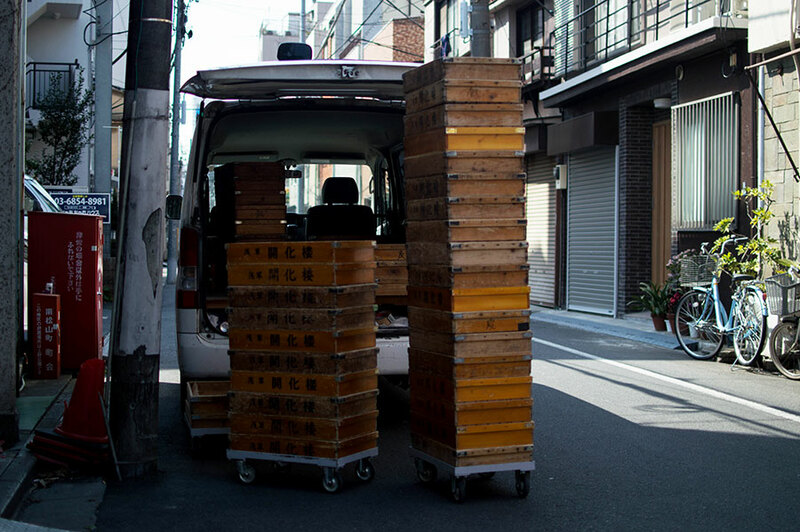 Well there you have it; my guide – albeit quick – to Kyoto. 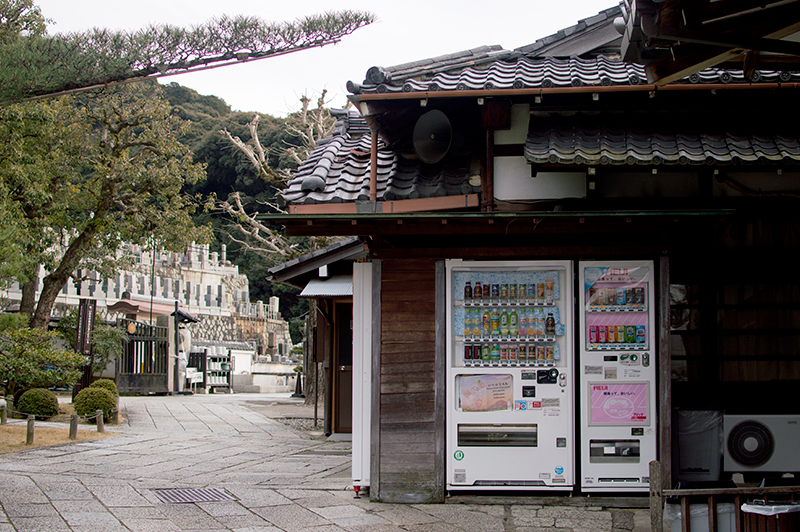 Feel free to share your favourite Kyoto locations in the comments! 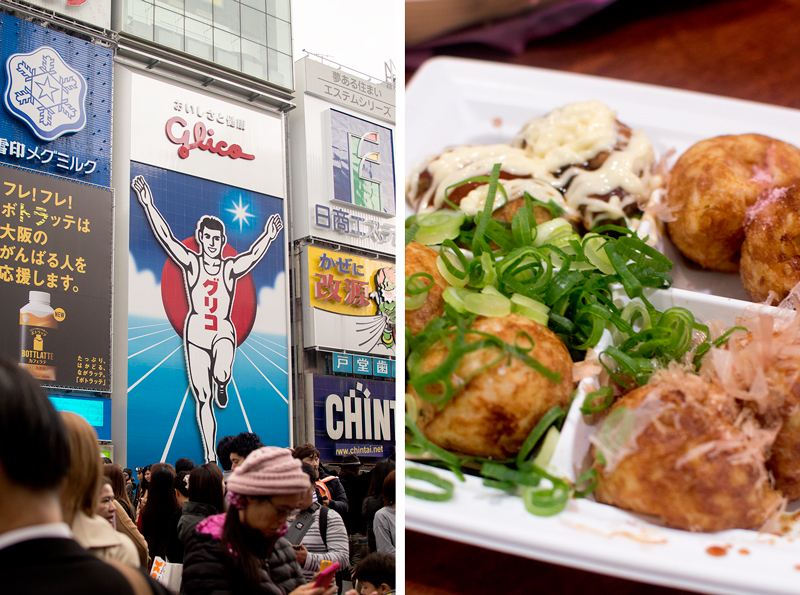 This year’s Japan trip included a few days in the land of takoyaki, comedians and awesome old ladies. Yes, Osaka was new ground for me. I’d visited the city ever so briefly 5 or so years ago, but had never fully discovered the city. 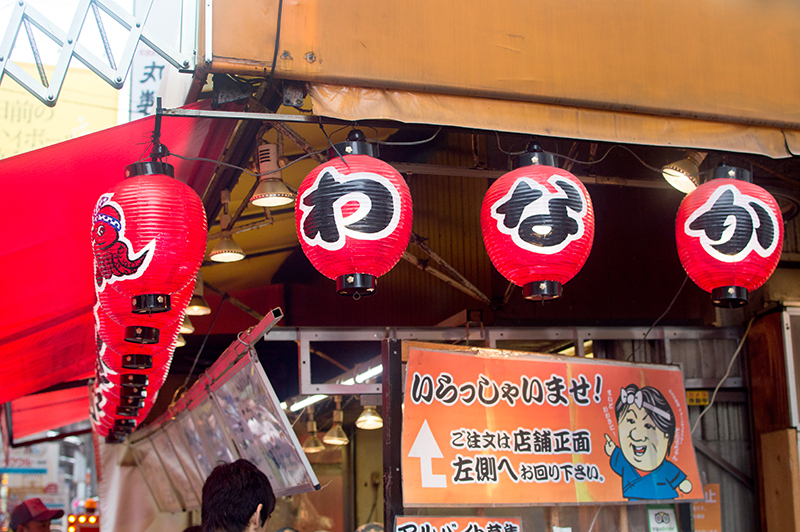 I was eager to see if the people were as friendly as my friends claimed, and whether the food really was some of the best in Japan. 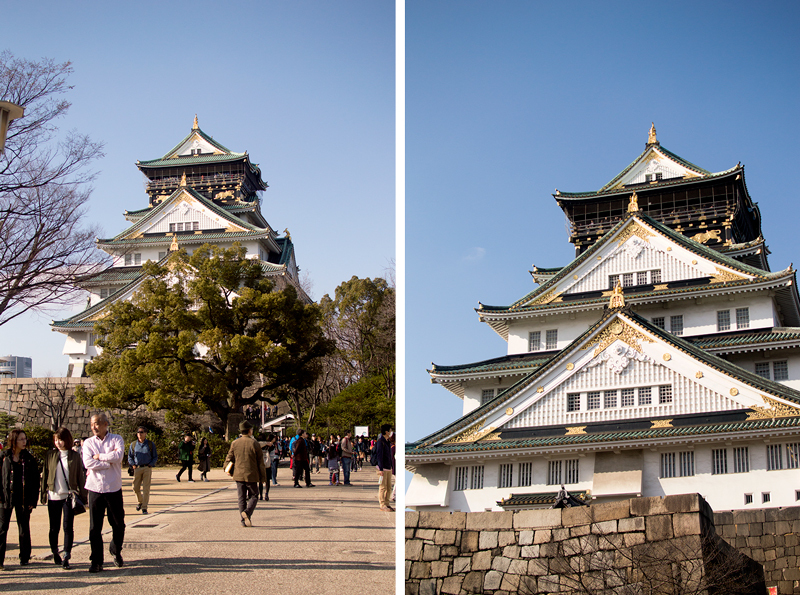 Wander Around Osaka Castle – I’m not saying you should go inside and do the whole tourist thing. No. 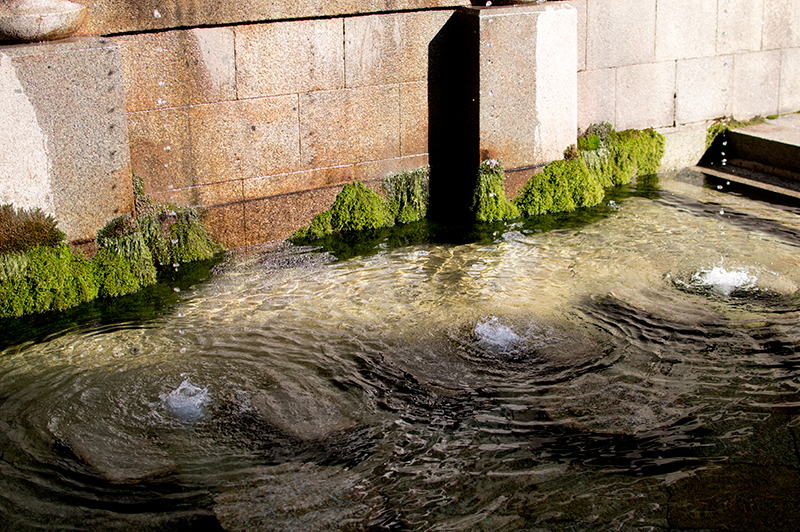 Check it out from the gardens (it’s beautiful), then spend your time eating ice cream – try matcha or kinako – and people watching. If you’re lucky you’ll catch the groups who hang out with their pets – on a good day this may include dogs in costumes, birds of prey and owls. Yep. 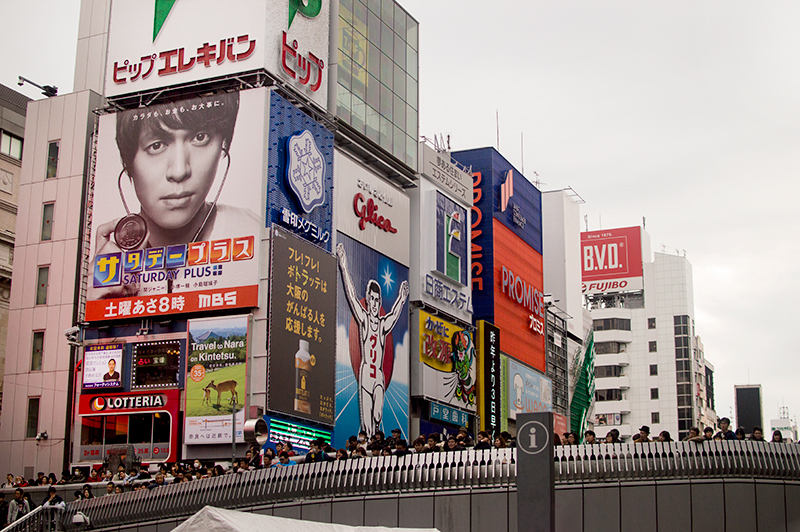 Go See The Running Man – Glico’s running man sign is a famous tourist spot for the Japanese when visiting Osaka. 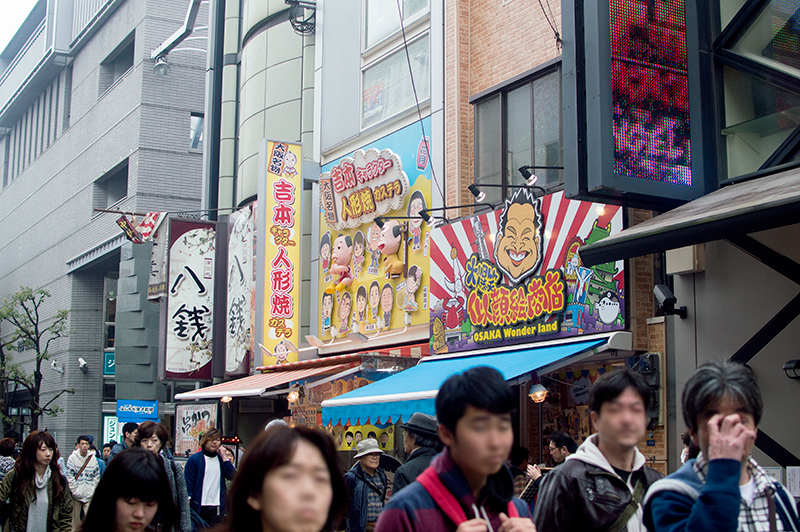 Situated in Dotonbori, the running man has been towering over Ebisubashi (ebisu bridge) since the 1930s. It’s a popular spot to take photos – whilst impersonating the sign – and there’s plenty of cool shops and food stalls to check out nearby. 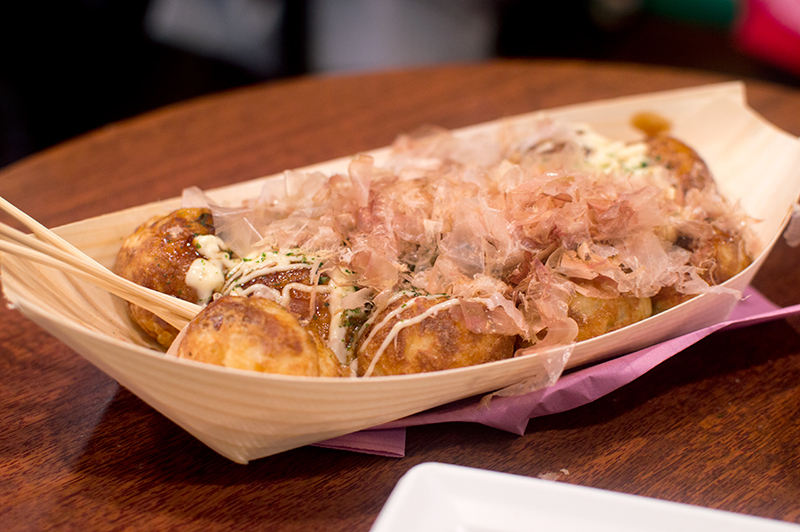 Try Some Takoyaki at Wanaka – Takoyaki (battered balls filled with octopus) is the dish of Osaka. 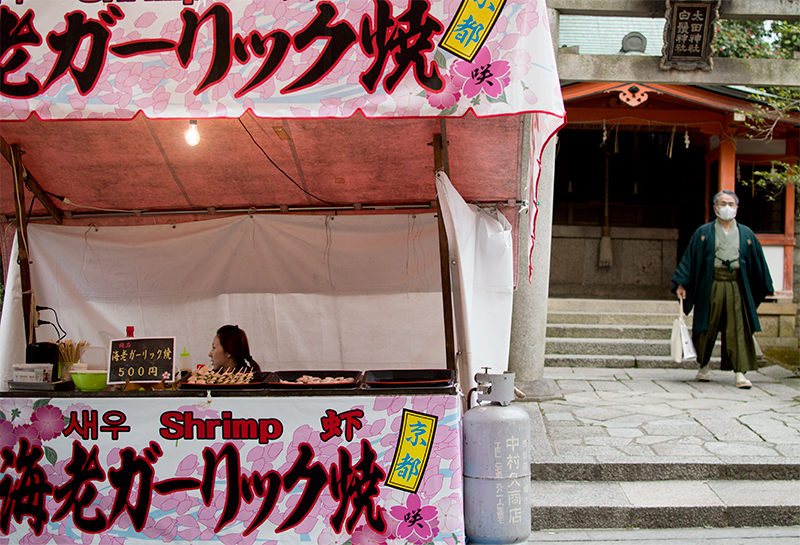 You’ll find this popular dish all across Japan, but it originally comes from Osaka. 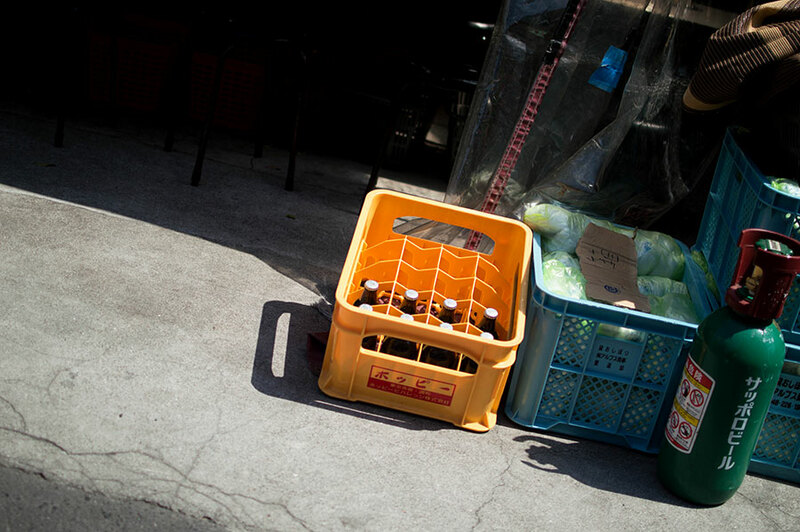 Wanaka is one of the best in Osaka with a variety of flavours, and prices ranging from £2-£4. Try the Ooiri Set for a taster. Visit Osaka Aquarium Kaiyukan – This walk around aquarium is one of the largest in the world, and includes a large variety of sea animals. The venue is laid out with 18 areas that represent various countries and regions across the world, with the corresponding sea life. See Osaka from the Sky – Umeda Sky building may look like a rather impressive office tower, but it’s actually full of restaurants, arcades and a viewing platform. The view from the top is impressive, especially at night. So there you have it, my Osaka Travel Diary. 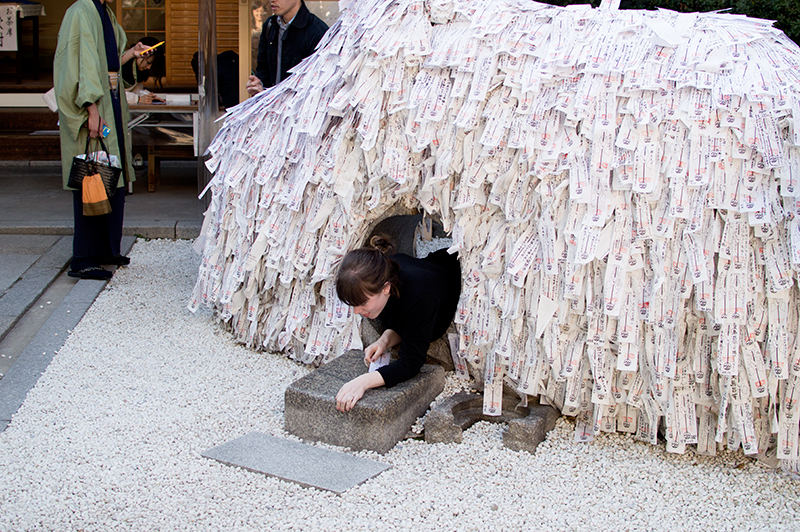 Feel free to leave your tips for others, and let me know your favourite things to do in Osaka. 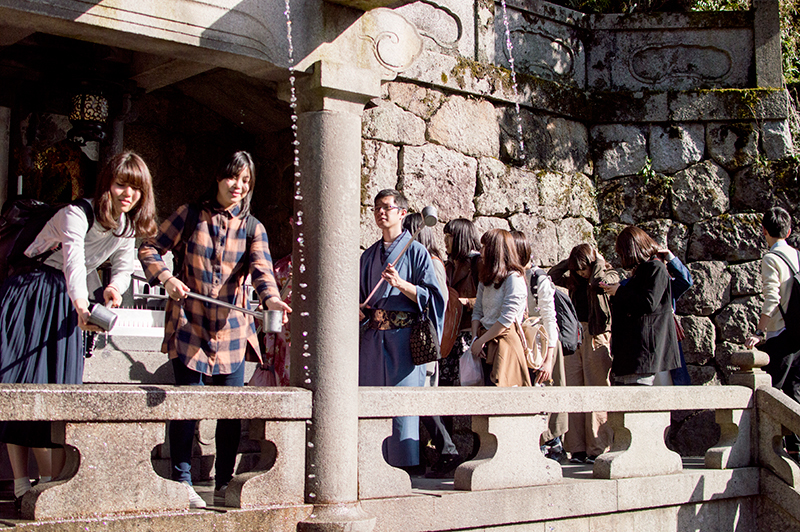 What makes Kyoto Shrines and Temples special? Kyoto’s shrines and temples are pretty special to me. There is a certain air of tranquility and calm surrounding Kyoto, and I think this even translates through to their tourist locations. There is so much beauty to take in around this region, and I don’t think I will ever bore of it. 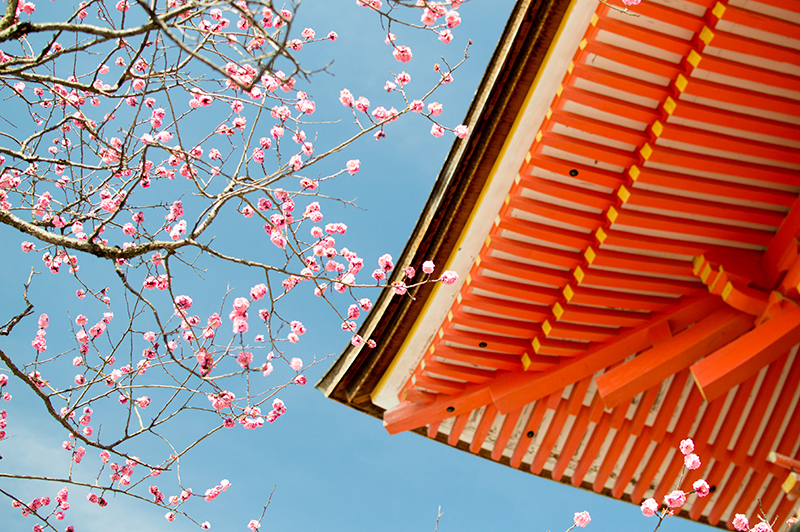 Which Kyoto Shrines and Temples should you visit? 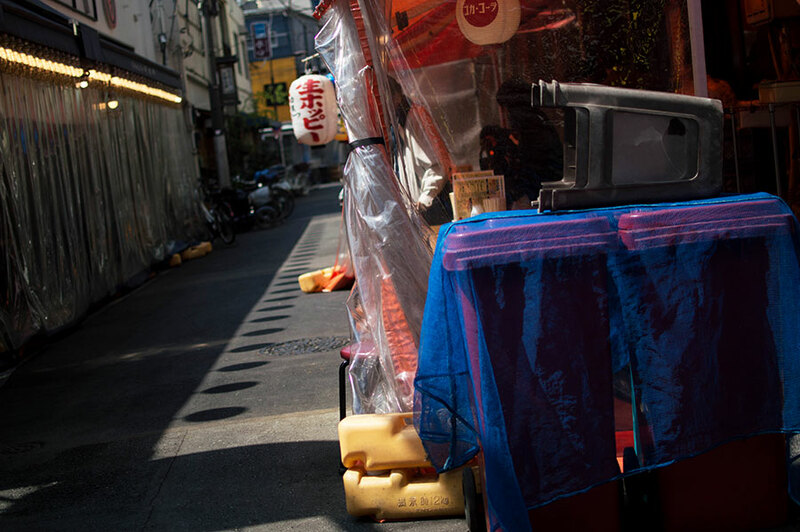 Fushimi Inari – You may recognise this famous shrines red gates from movies such as Memoirs of a Geisha. Climb to the top of the mountain, and brag about it after. 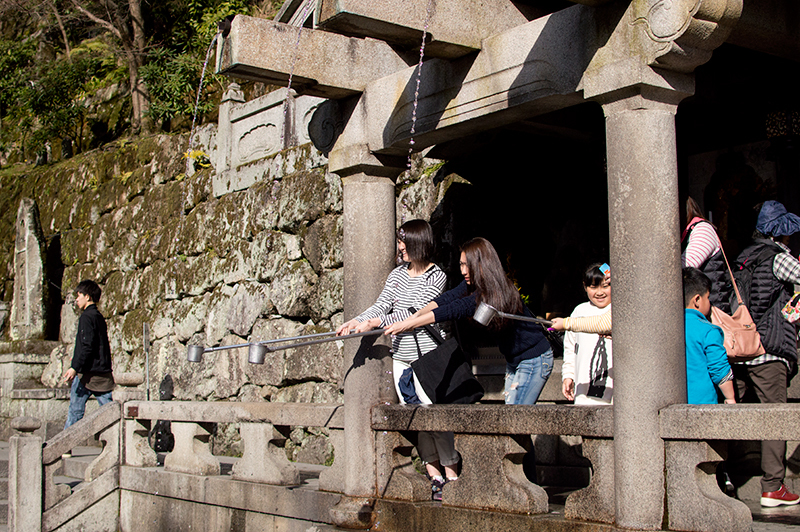 Kiyomizu-dera – Featuring the famous ‘floating platform’ and a waterfall that supposedly grants wishes. 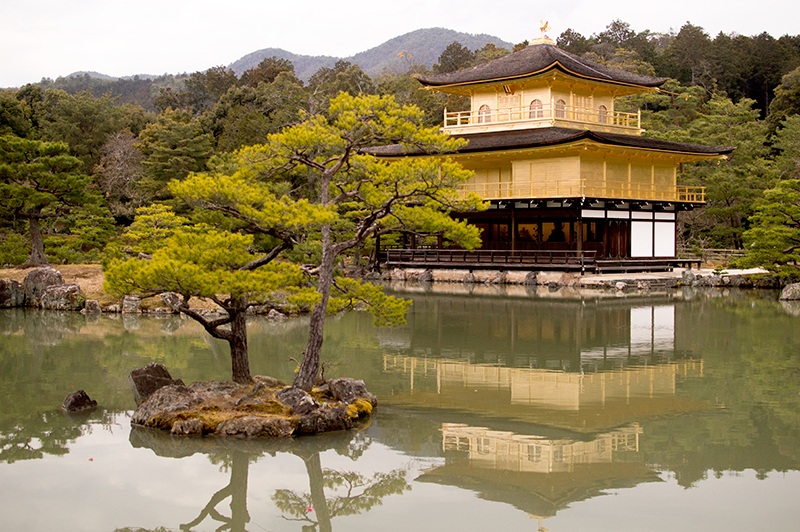 Kinkaku0ji/Rokuon-ji – The ‘Golden Pavilion’ is known worldwide for it’s beautiful golden exterior. Check out the amazing reflection in the nearby lake, and stroll through the garden. 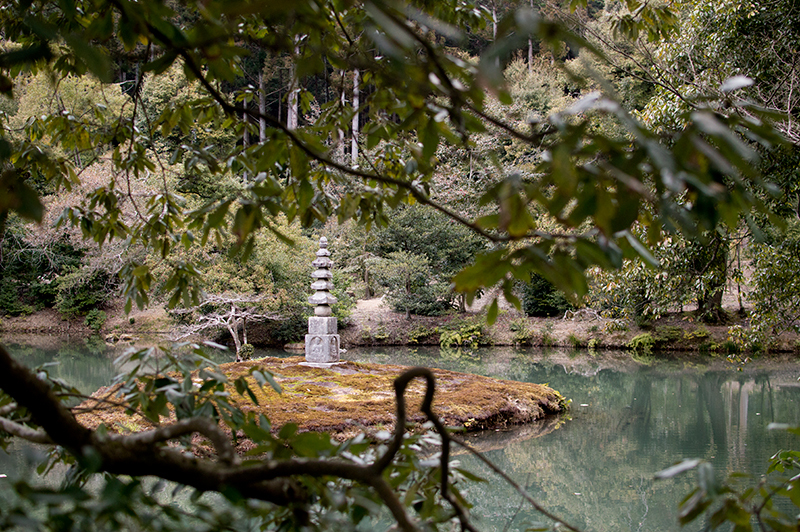 Ryoan-ji – A must-see for any zen garden fans! 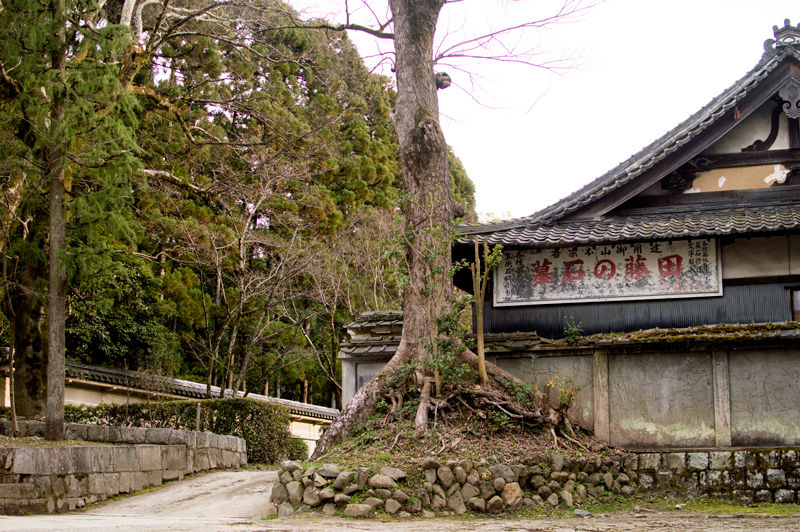 Saiho-ji – This is actually on my list of temples to visit. 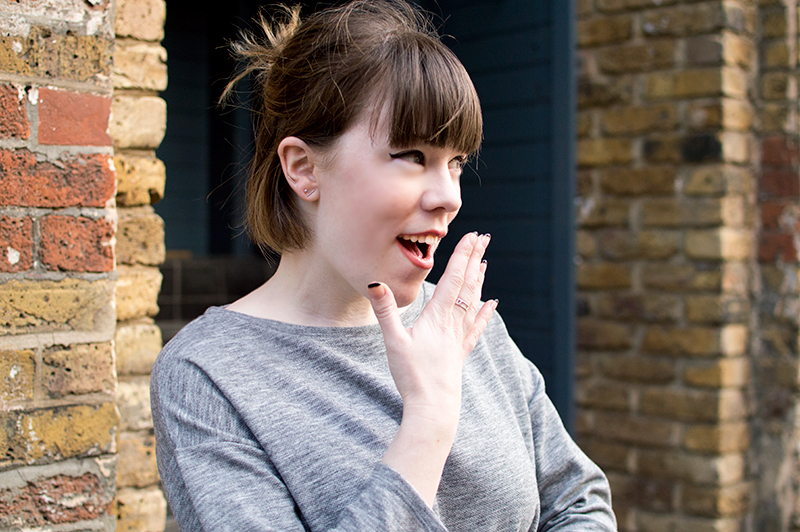 This natural beauty has a difficult entry procedure, but it sure looks like it’s worth it! This is just a small list of temples and shrines to visit in Kyoto. However I would also recommend just wandering around Kyoto, because you will come across tons of smaller shrines/temples that are just as wonderful. 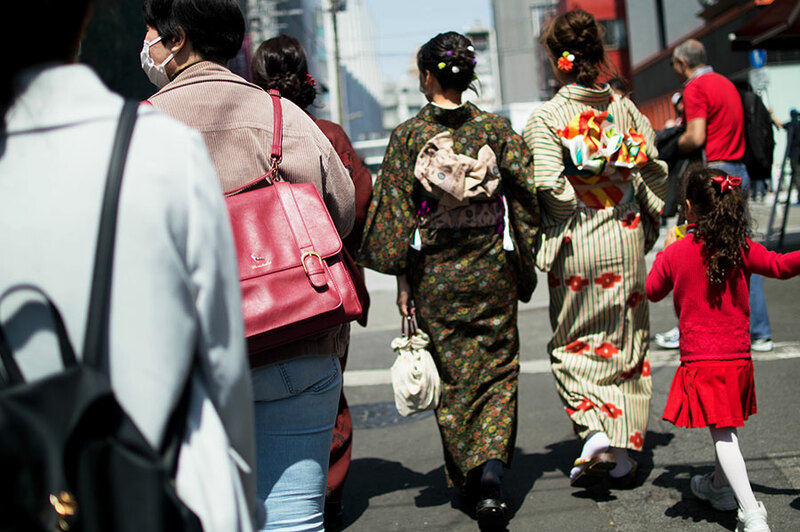 Check out the rest of my Japan Travel Diaries here.